The troy ounce weight, gold content, and gold purity of the American 1 oz Gold Buffalo Coin are guaranteed by the Government of the United States of America. Buy 1 oz Gold Buffalo Coins on our online store or by phone. Add the American 1 oz Gold American Buffalo Coin to your gold investment portfolio. 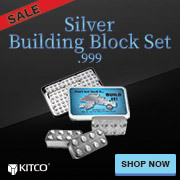 Buy 1 oz Gold Buffalo Coins from Kitco today. You can store American 1 oz Gold Buffalo Coin safe and securely with Kitco Allocated Storage. Why buy 1 oz Gold Buffalo Coins from Kitco? The 1 oz Gold Buffalo Coin(s) you receive may be from a different years mintage and the appearance may be slightly different from the one illustrated. The 1 oz American Gold Buffalo Coin(s) you receive may not be in mint condition.